ExxonMobil will have to drill about twice as many new wells as Chevron to reach the communicated production goal. The explanation relates in part to the difference in base production. As of 2018, Chevron's unconventional output in the Permian was 75% higher than ExxonMobil's, and the latter company will therefore have to accelerate drilling activity in order to close the gap and even exceed Chevron's supply by 2025. Chevron also exhibits superior average land quality and well productivity, which explains the remaining part of the gap in wells needed to deliver on long-term production guidance. Chevron does not currently aim to ramp-up drilling in the Permian. The operator believes the current program is already optimized with respect to well fundamentals and midstream infrastructure. ExxonMobil, on the other hand, is convinced that a large scale ramp-up of its Permian drilling campaign is exactly what it needs in order to achieve capital efficiency and generate billions of dollars in cash flow from the region by 2023. Both supermajors are well positioned to become the leaders in the Permian for years to come. Chevron's legacy land accounts for 1.7 million acres across the Permian Delaware and Permian Midland basins. ExxonMobil currently owns 1.6 million acres in the Permian, but this also includes a significant portion that is attributable to conventional targets in the Central Platform. Chevron has larger upside potential in the Delaware, while ExxonMobil holds more drilling locations in the Midland Basin. 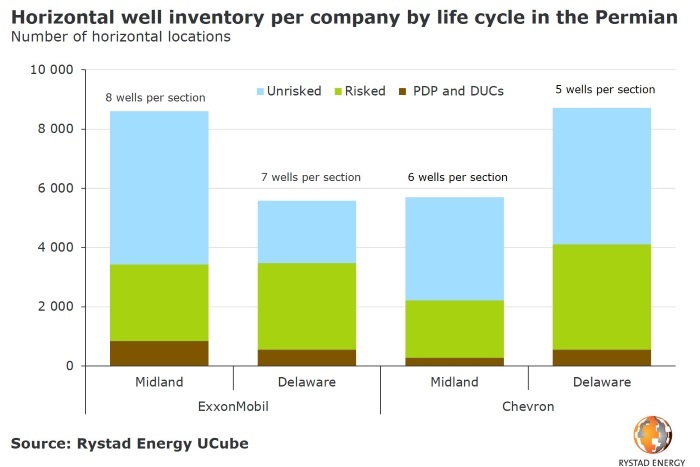 Moreover, Chevron's inventory is expected to deliver an average of five wells per section in Delaware and about six wells per section in Midland, while ExxonMobil will be able to place seven and eight wells per section in each basin, respectively, according to our assessment. Driven by exceptional well productivity, Chevron is able to achieve exceptionally low costs for each barrel of oil equivalent (boe) produced in both the Texas and New Mexico parts of the Delaware Basin, standing at below $5 per boe, as measured in so-called two-stream estimated ultimate recovery (EUR). ExxonMobil's cost comes at a slightly higher level of about $6.30 per boe, which is still considerably below the average of between $8 and $9 per boe. In the Delaware Basin, which is less developed than the Midland, Chevron is the indisputable leader in terms of average pad size as of 2018, and this applies to both the Texas and New Mexico sides of the basin. ExxonMobil comes immediately after Chevron on the New Mexico side of the state border, with 3.3 wells per pad last year. In the Midland Basin, meanwhile, Chevron clocks in at about four wells per pad, and thus ranks again among the industry leaders. “Undoubtedly, Chevron and ExxonMobil are the two companies that will maintain the long-term leadership in the Permian in terms of total volumes produced. 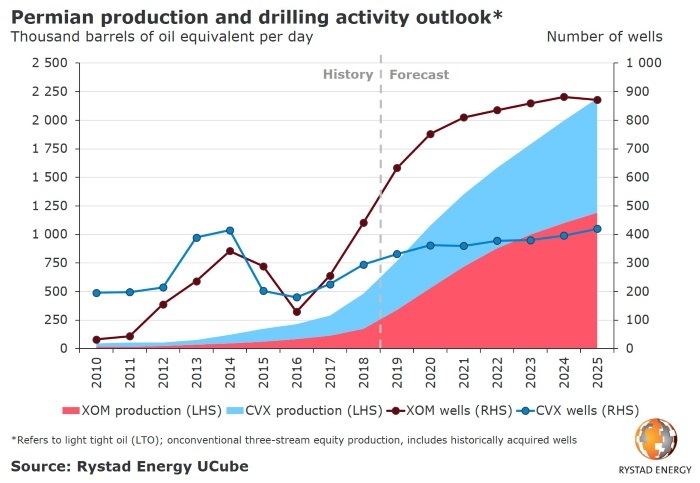 Driven by extensive inventory of wells and upside potential, these players are set to increase collective output to over 2.5 million barrels of oil equivalent per day by 2030, leaving all well-established shale producers behind,” says Artem Abramov, Head of Shale Research at Rystad Energy.